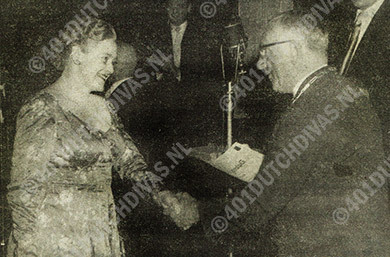 At the time of her 1959 participation in the IVC Contest, Elisabeth Simon (1930–??) was 25 years young and she had a predilection for the music of Mozart. Other than that little is known about her except that she was already performing since 1955. In that year a semi-amateur school performance from May 7, at the Dartford County Grammar School for Girls could be traced. The work performed was Händel's Jeptha, conducted by Hubert Langley. By 1956, Simon took the soprano lead in the St.–Matthew's Passion at the Palm Sunday performances given at the Town Hall, Oxford by the Oxford Bach Passion Choir and Orchestra. This means that she arrived to the 5th International Vocal Competition 's Hertogenbosch with a surplus of experience. 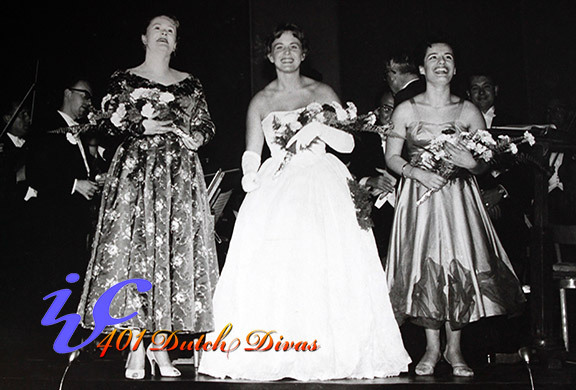 Her lot was comprised of 'I know that my redeemer liveth' from Händels' Messiah, Duparc's song 'L'invitation au voyage', and the prize winning highlight of the competition, the startling Zerbinetta aria 'Grosmächtige Prinzessin' from Richard Strauss' Ariadne auf Naxos. Critic Leo Hanekroot of De Tijd thought her equally brilliant in all three styles, plainchant, the distinguished splendor of a song like 'L'invitation', and the bravura of daring opera coloratura. At the same time he noticed that she was very 'English' in being somewhat reserved in her expression, and a bit cold. These features may well have confined her career to the British provinces, where she can be traced until the early 1970s. She participated there in song recitals, and was a noted soloist in Bach's St. Matthew Passion, and was a noted solist in Bach's St. Matthew Passion. Elizabeth Simon, Anne Wood, Bruce Boyce, Eric Greene, David Galliver and Trevor Anthony. Elizabeth Simon, Kathleen Joyce, John Wakefield, David Galliver, William McCue and Trevor Anthony. Hugo Rignold, Peter Katin, Kenny Baker, Tony Coe, Elizabeth Simon, Thomas Baptiste. Heather Harper, Elizabeth Vaughan, Elizabeth Simon, Jean Allister, Norma Procter, John Mitchinson, John Holmes, Alfred Orda. Elizabeth Simon, Margaret Cable, Peter Bamber and Roger Stalman and the Reading Symphony Orchestra (with words). Elizabeth Simon, Paul Esswood, Ian Partridge and David Thomas (vocal) with the London Orpheus Choir and Orchestra, conducted by James Gaddarn . Royal Festival Hall, BBC Symphony Orchestra, BBC Chorus, BBC Choral Society.